Thanksgiving has come and gone... and no turkeys were harmed in the making of my dinner! Isn't that a good feeling? I usually enjoy Tofurkey or just gobble up a delicious plate of "side" dishes at Thanksgiving dinner but this year my husband and I tried Celebration Roast made by the Field Roast Company. 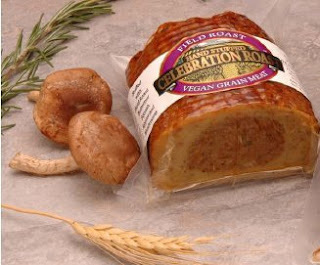 The celebration roast is a faux-meat style loaf stuffed with mushrooms, squash, apples and other yummy vegan bits. It warms quickly and slices well. And nestled among mashed potatoes, green beans, and cranberry sauce on my holiday plate, it did look festive. I agree. It has a lot more flavor and a better texture than Tofurkey. Also, the mini-loaf is sized more conviently for feeding a smaller veggie crowd. Check out Celebration Roast for one of your upcoming holiday meals over the next few weeks. Yesterday was my husband's birthday and we had a few friends over to celebrate. Instead of the traditional cake, I made apple crisp to follow our dinner of salad, chili and cornbread. It seemed to be a hit. The six of ate the entire pan of apple crisp -- there wasn't one bite left to photograph! 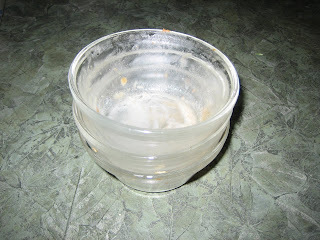 Instead, all I was left with was bowls licked clean! One guest, an immigrant from France, said it was only the second time in his life that he was served a fruit crisp that he actually liked. Pretty high compliments from a man who has eaten his share of amazing French desserts. Actually, I can't take all the compliments. 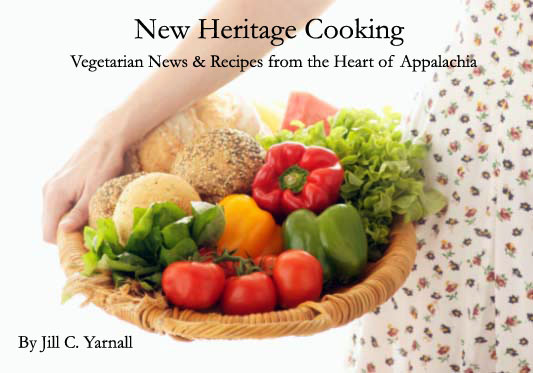 This old-timey recipe was my grandmother's. I tweaked it just a bit to "veganize" it. I love serving it warm with a scoop of vanilla Soy Delicious -- pure comfort food! Preheat oven to 375 degrees. Lightly coat a glass baking dish with cooking spray and set aside. Place apples in baking dish and sprinkle with lemon juice. Toss to coat. In a small bowl, combine flour, oats, brown sugar, salt, and cinnamon. Cut in melted butter until mixture is crumbly. Sprinkle over apples. 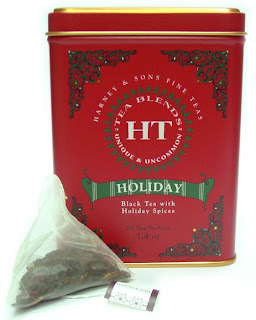 My new favorite obsession is Harney & Sons Fine Teas' Holiday Tea. I can't stop drinking it! This magical holiday elixir is a fragrant blend of black tea, holiday spices, orange peel and almond. It's so warming and delicious brewed strong with a teaspoon or two of pure milled sugar. YUM! It's just the right taste, just in time for the holiday season. I found it at Barnes & Nobles but its also avaiable at fine food stores and online. Try it. I promise you won't be disappointed. I predict you'll be drinking it all winter long and giving away this wonderful tea as gifts, too! 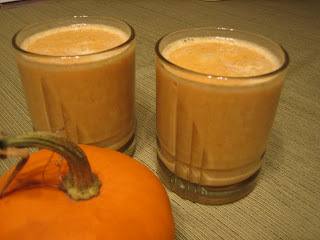 Sticking with our pumpkin theme, I whipped up a Pumpkin Pie Smoothie that you'll want to try. It makes great use of leftover pumpkin -- or a good reason to open a new can! You might even want to make this nutritious beverage on Thanksgiving morning for a light breakfast that will hint at the pumpkin pie to be served after the holiday dinner. To make this smoothie thick and frosty, you'll want to plan ahead. Freeze 1/2 cup pumpkin puree at least eight hours or overnight before you want to whip up this delicious drink. It works best to freeze the pumpkin in an ice cube tray, making about six cubes. Makes two small smoothies -- or one big one! Veggie Heroes Sweep "The Veggie Awards"
The December 2007 issue of VegNews is on the stands, touting the best of veggie living in their "Veggie Awards 2007." I was so pleased to see four of our very own Veggie Heroes taking top prize! If you want to learn more about these compassionate Super Stars, be sure to click on the links below to read exclusive interviews. Here in the mountains, we are waking up to frost and low morning shadows creeping across the valley. These kinds of early November days get me excited about the upcoming holidays and all the wonderful foods that appear for just a few short weeks. Pumpkin pie is a truly big deal in my family but this nutritious vegetable doesn't need to be completely relegated to resting in a flaky crust. It's versitile and can lend a Thanksgiving vibe to lots of other foods. 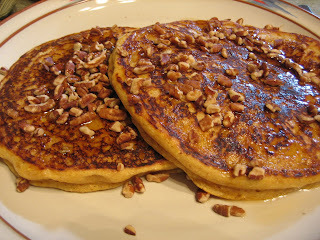 And these chilly mornings before Thanksgiving are the perfect time for piping hot pumpkin pancakes. I had fun creating this recipe with Silk soymilk's newest flavor: Pumpkin Spice. But it will work equally well with vanilla soymilk if you can't find this specialty drink -- or if you just want to make it after the holidays are over! And don't throw away the remaining pumpkin in that can -- we'll use it later this week, so stay tuned! Place pecans in a small dry skillet. Toast over medium heat until just fragrant -- about 3-4 minutes. Set aside. Add soymilk, pumpkin and maple syrup. Mix until just combined. Lightly spray a large skillet with cooking oil and warm over medium-high heat. Measure about 1/3 cup of batter onto the hot skillet. Flip pancake when bubbles appear and burst on the upper surface, about 2 minutes. Cook for another 2 minutes or until set.